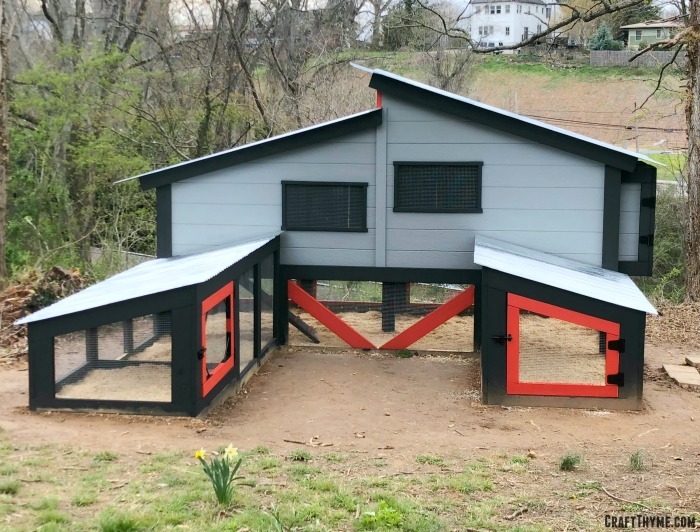 Modern Chicken Coop Custom Design By US! The custom built, modern, chicken coop is finally here folks. I quit totaling hours, cost, and number of minor flesh wounds received somewhere back in March. 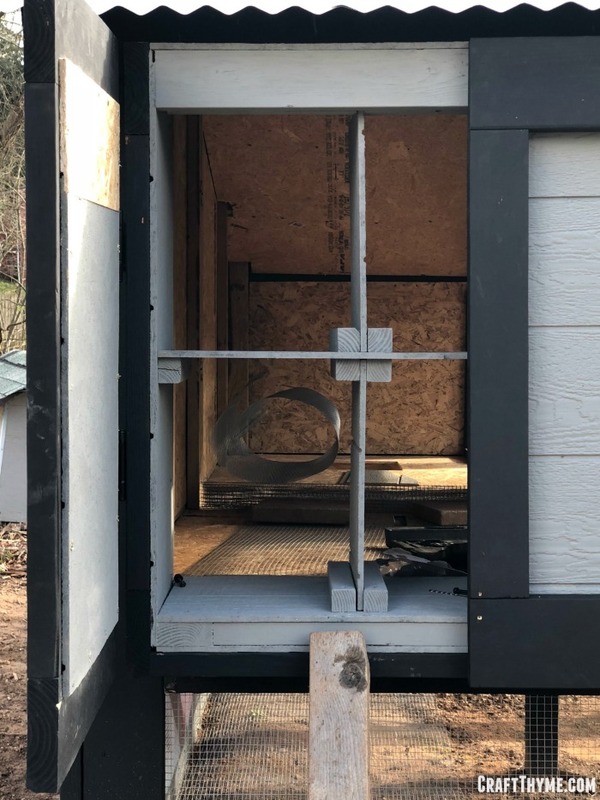 Building a custom chicken coop is definitely a labor of love BUT you get an end result that can REALLY meet your needs. 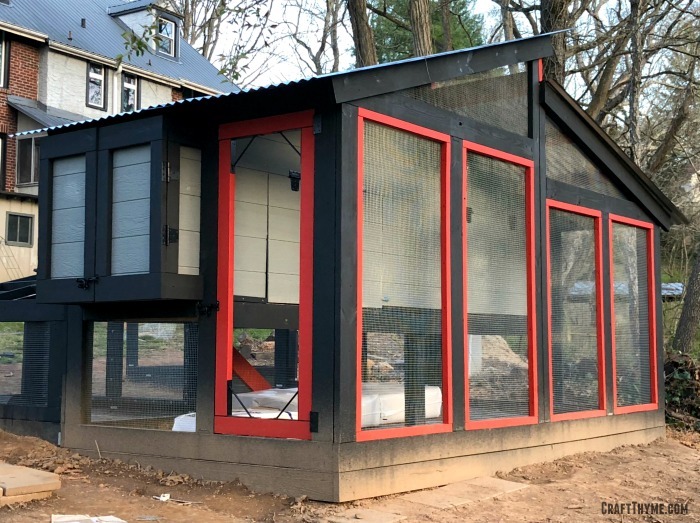 We chose to make a modern chicken coop design to match our urban locale. We needed something fresh to update our 1927 home space and to compete with all the new modern houses in the neighborhood. 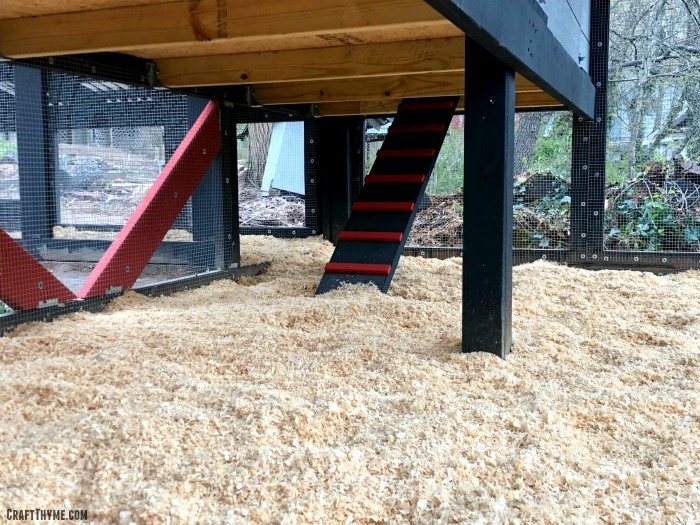 We had some specific needs in mind with this modern chicken coop design. First, our chicken coop needed to be predator proof, easy to clean, lots of space, and aesthetically pleasing. We live in an urban environment with a good mix of old houses and very modern structures. This means we can’t let the chickens roam all day but that we can build a modern looking structure and still have it blend nicely with the 1927 house. If it looks large in the pictures, that is because IT IS. It is hooouge… 14 by 7 feet in the main structure alone. The u legs of the runs are 4 feet wide and 6 foot and 10 foot long respectively. This gives us slightly more space than needed for 14 large chickens. If you are thinking of making your own coop I have a series of chicken calculating spreadsheets that I will make available soon for everyone to use.. We want to keep the chickens in a location with above standard size spacing since the whole point of raising fancy backyard chickens is to have a good environment for their egg production. Happy, healthy chickens make yummy eggs. We also planned the chicken coop with our neighbors in mind. We are highly sensitive to our neighbors needs, simply because it seems like the neighborly thing to do. We wanted to make it look good and smell decent because, frankly, I would want that type of thoughtfulness from my neighbors as well. Plus, I have to look at the chicken coop and smell it all the time too! Plus, who doesn’t want to look at this awesome modern coop design back when scooping poop? It is honestly my favorite part of the coop! Safety was paramount to the entire design. When we first moved over to our new home we had chicken issues abound (You can read our tale of chicken woes). Plus I have had enough bear encounters for a lifetime! Remember how I said urban? Yeah we have an odd urban bear population in the mountains… These bears seem to like chickens an awful lot. Anyway, we did as much as we could to deter predators. First, the structure has cemented posts to anchor it to the ground. Then we wasted ridiculous amounts of money to bury hardware under the entire structure. It kills me to spend money on something you are just going to hide but the hardware cloth keeps digging predators out but allows the thick layer of chips to slowly compost while in location. Half inch hardware cloth and metal roofs cover all exposed surfaces. These are anchored with screws and washers instead of staples. It takes a lot longer to install but really stands up to random dog attacks. 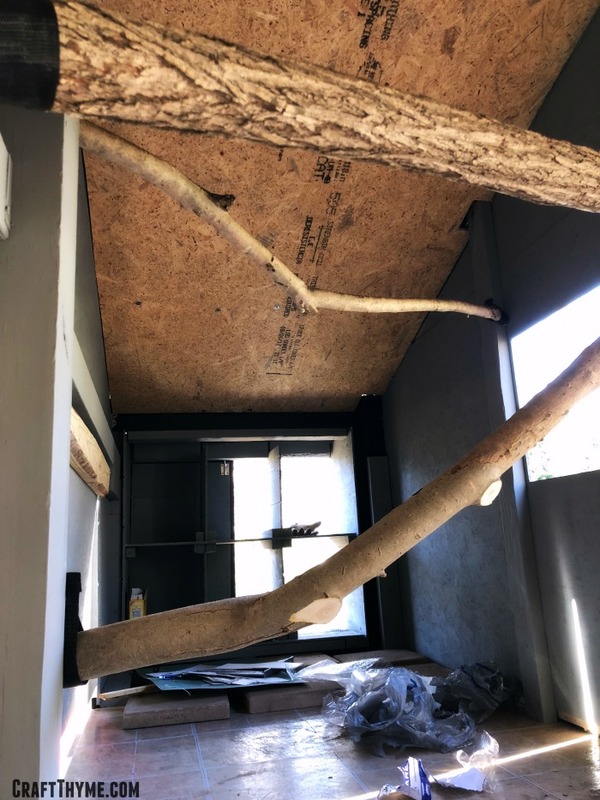 All the external doors, including the nesting boxes, have wooden stops to make sure they can’t be easily pushed in and to minimize small gaps in the frames. We used heavy duty slide clasps and hinges for the same reason. If we end up having raccoon issues we can add bolts or locks to the clasps to make sure they can not get in. Roosting bars are strapped in over vinyl floors to make easy cleaning! Chickens, outside of their will to die by predator, are actually pretty self sufficient when grown. You really just have to offer protection from major elements and lots of ventilation. The coop location is meant to assist with both. Our climate is more often cold than hot. That being said August is not the most pleasant. We set the coop back in a U shape of vegetation (called a sun scoop in permaculture world). In the winter they get sun at different sections of the coop throughout the day. In the heat of the summer they will get morning sun, but shade from the worst afternoon heat. The large windows can be closed in the winter to allow more wind protection but open in the Spring, Summer, and Fall to allow for lots of ventilation. An underfloor ramp allows for fresh air all year around but cuts down on wind. Finally we took the time to line the roof of the coop. That way chickens on roosting bars couldn’t come in contact with cold metal and get frost bite or hot metal and overheat. Finally we wanted to make this easy, fun, and accessible for our enjoyment. This area was formerly an overgrown dog lot. The kids liked to play down in that area as it is shady in the Summers, but even they stayed away from the overgrown infestation of English and poison ivy. We beat back the wilderness and have all manner of edible and aesthetically pleasing plantings planned for the area. We left cleared around it and plan to have nice paths down and around so you can enjoy the plantings and sit and watch the chickens. Lots of doors and human sized runs allow us to go in with the chickens and easily pass them treats and eventually let them into the yard to hang out. The nesting boxes make for quick egg retrieval and plenty of space to leave the broody ones alone. Finally, we made much of the area view-able from the house so we can always just peek out and see how the ladies are doing. Overall we are stoked with how it turned out. Now to get our last batch of chicks old enough to join the rest of the flock! Hopefully the chickens will enjoy it just as much as the humans. Is there full plans available for this beauty? Sorry no! We would love to make plans, but would need to have a draftsman come in and sketch it up. We draw them for ourselves before we build anything, but they are nothing that anyone could use to build them. This is a chicken palace!! My chickens would have loved this back when I had them!! We have been calling it the Taj Ma Coop. Trust me, it is much nicer than any of my chickens have ever had! What a great job! I foresee some very happy chickens! Thanks for sharing with SYC.